Preparing trays of powdered sugar at Brock Candy Company. The Brock Candy Company dates to 1906, when William Emerson Brock, a traveling sales representative with the R. J. Reynolds Tobacco Company, purchased the Trigg Candy Company of Chattanooga. Three years later, he reincorporated the company as Brock Candy Company. By the time of his death in 1950, Brock had built his family-run company into one of the largest candy companies in the United States. Brock Candy initially produced penny candies, including southern favorites like peanut brittle and fudge, but in the 1920s, it expanded production to include marshmallow and jelly candies. In the 1930s Brock Candy introduced Chocolate Covered Cherries, which quickly became a Christmas favorite. At the same time, Brock found innovative ways to deal with the problems presented by the depression. When the bank moratorium of 1933 made it impossible for Brock workers to cash their paychecks, Brock collected his daily receipts from local retailers of his candies and paid his employees in cash. World War II also presented challenges in the form of rationing of sugar and other supplies needed in the candy-making business. Utilizing the abundant supplies of corn syrup and peanuts, the company introduced the Brock Bar, a coated peanut roll. W. E. Brock stepped down as president in 1945 and became chairman of the board. By 1950, the year Brock died, the original candy company had grown to encompass an entire block of downtown Chattanooga, including a five-story, 180,000-square-foot building. Pat Brock, a grandson of W. E. Brock, took charge of Brock Candy Company in the mid-1950s. The company continued to grow, adding a 64,000-square-foot warehouse just outside of Chattanooga in the 1960s. 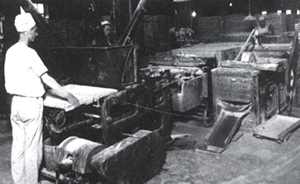 In the 1970s Brock acquired out-of-state candy companies including Schuler Chocolates of Winona, Minnesota, and moved production of Brock’s Old Fashioned Creme Drops, another popular candy, to this plant. In 1976 the company moved its headquarters and manufacturing operations from downtown Chattanooga to the thirty-acre site of its distribution warehouse. In the early 1980s Brock Candy Company became the first candy company to produce the popular “gummie” candies, including gummie bears and gummie worms. The company also introduced fruit snacks and quickly became an industrial supplier. Brock Candy Company went public in March 1993, offering 2.3 million shares of its stock, giving asset diversification to stockholders, and providing funds for the company’s planned expansion in Europe. Brock Candy also purchased an interest in Clara Candy Company of Ireland in 1993 and continued its expansion in the United States. In late 1994 the E. J. Brach Corporation purchased a controlling interest in Brock Candy for $140 million. Until the acquisition of Brock Candy by the E. J. Brach Corporation, Brock Candy had remained a family operation under the management of Pat Brock and his four sons. In late 2000 Brach’s Confections announced that it was ceasing the production of hard candy at its Chattanooga plant, concentrating instead on the growing fruit snack market. In January 2001 the company announced it was closing its large Chicago plant, ending candy production but shifting more fruit snack production to the Chattanooga factory where four hundred employees worked.